An electrical contractor will always tell you that good lighting is everything. These are not empty words as both homeowners and store owners can agree. The benefits and functions of light in any location are numerous. It is one of the primary reasons we use electricity. Lighting illuminates a space to give you clarity and vision, but in contemporary times they do even more. Lights can boost your business in a commercial building. They can improve security, productivity, and efficiency. Also, studies have shown that lights can be associated with good mood and a relaxed mind. Lighting installations are performed by electrical technicians. These installations range from simple tasks such as light fixtures to more complex installations like recessed lighting. To give you some insight, here are different types of new lighting installations. Like the name sounds, track lighting involves more than one light installed along a fixture. These lights can be controlled to light up any general direction. This makes them efficient. Track lighting can also add beauty to a place because of their unique placement. These lights are installed in the ceiling but are different because the fixtures cannot be seen. You can think of recessed lighting as a bulb pushed into the ceiling till all you can see is the light emanating from a circle above. There are a variety of recessed lights but you should hire a professional electrician to install them. 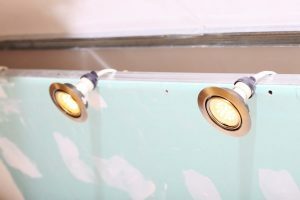 Wall light fixtures protrude from drywall. They have to be hard-wired into your home. People mostly use wall lighting for aesthetic purposes. They also offer a wide variety in design. This is the category for chandeliers and other dropping light fixtures. They light up any space but also have decorative functions. Chandeliers have several forms and are often called premium lights. They might not drop to the ground but their exotic structures add length to these lights. Pendant lighting and chandeliers should be chosen and installed carefully because they are very visible and can set a theme for their location. You would want under cabinet lights installed in the kitchen to aid you during food preparation. They can also be any size and shape. Always consider the ceiling height when deciding what installations to use. Low ceilings work better with recessed lights and not pendant lights. It is important to know your lighting installations plan before construction of your home. This way the structure doesn’t deprive you of the fixtures you desire. However, if you live in a rented apartment, your choices might be limited to following the already provided structure. There is no rule against infusing creativity in your lighting installation plans. Discuss your ideas with the electrical contractor to know if they are possible. Ensure that you think of function before aesthetics. Hence, your first lighting installations should be exterior lights, basement lights, lights in the stairs, and so on. This entry was posted in Lighting Articles. Bookmark the permalink.